This year all around the European peninsula, extreme weather phenomena altered the ordinary life and habits of millions of Europeans during the summertime. Starting from Northern Europe, throughout Scandinavia, many areas in Norway, Sweden and Finland hit all-time highs this summer. By analyzing data from weather stations in northern Europe, the researchers found that a high barometric barrier prevented the jet stream from blowing in northern Europe and kept away the heavy Atlantic clouds. As a result, for Denmark, June 2018 was the warmest of the last 26 years. July was the sunniest of all times, while the night of 30th to July 31st was the second warmest in the history of the country. In Finland, areas north of the Arctic Circle made a record of 33°C while the northern province of Lapland was hit by disastrous fires. Sweden experienced an unusually long heatwave and had only 13 mm of rain from the beginning of May to late July. Both months of May and July 2018 were the warmest months ever recorded in Sweden. As temperatures were more than 10°C above normal throughout July, Sweden faced severe repercussions from the hot weather, starting with the forest fires that destroyed more than 250 km2 of green forest of timber, an unprecedented event in the history of the country that activated the European Civil Protection Mechanism with many European countries sending firefighters and Canadair airplanes to assist the national authorities. And if someone thinks that hot days may be pleasant news for a region that lacks sun and heat, then they should think again. Only in Denmark, hospitals have recorded 250 more elderly deaths this summer compared to the average, and tourists for the first time complained to hotels for the lack of air conditioning. In addition, there were even geological changes: Sweden lost its highest peak, as the glacier southern tip of Mount Kebnekaise in the Arctic lost 14 centimeters a day in July, losing its position as the highest peak of the country. Scandinavia, of course, was not the only part of the European peninsula to face this unusual, hot summer. In Austria, there were areas that had 85% less rainfall than 10 years ago. The majestic Dachstein glacier “is melting so fast you can see it with your naked eye,” as meteorologist Klaus Reingruber told journalists. According to researchers at Innsbruck University, this summer was the hottest June on record since 1767, when the country started keeping track! In France, the national electricity company had to close one nuclear reactor as the water temperature of the nearby river that is used to cool the system down had risen too much. More outstanding was the fact that some parts of France were hit by extensive heatwaves and droughts, and some others were suffering from torrential rains and violent thunderstorms. In the Netherlands, the lack of rain severely affected its system of dikes because there was not enough fresh water countering the seawater. In Germany, temperatures were so high (up to 40 degrees) that the river Elvas dried up brining out to surface ammunition and grenades from the WW2! In Switzerland the drought left the cows without water causing the death of hundreds of them from thirst. Farmers had to turn to the country’s helicopter association and the Swiss Air Force to transport tens of thousands of gallons of water every week to keep the herds and the cows alive. In Britain, it was the hottest summer of the last years, with the most severe drought since 1961. Some of the most iconic London parks like the Hyde Park turned into yellow. The lack of rainfall throughout June and July was so severe that the London Fire Brigade chief Danny Cotton made an unprecedented statement to journalists: ”I’d never thought I’d say that, but we pray to rain”. Surprisingly hot days in Southern Europe were less frequent than previous years during this summer but several places in Portugal and Spain experienced record highs. Over the August, two people died in Spain from the high temperatures and a third in Portugal. Compared with last summer, however, when the lives of almost a hundred people were claimed, this year no period of long heatwaves and large wildfires was observed. In Greece, the lack of extreme hot days was also very unusual (no days more than 40°C were recorded in Attica during this summer), but the consequences were far more dramatic. On July 23rd the gusts of westerly winds that reached 123 kilometers per hour in Parnitha (the highest gust recorded during the summer of 2018 all over Greece) alongside with the hot day and the dry terrain lead to a catastrophic forest fire that took the lives of 97 people, injured few hundreds and destroyed thousands of houses and properties. Coming only a day after the severe floods from heavy rains that had affected Northern Greece, this was the deadliest fire in the history of the country and one of the deadliest forest fires in Europe throughout the last century. In Italy, 11 people died from ‘an valance of water’ as it was described, caused by heavy rain in the southern region of Calabria. At the Raganello creek, part of the Pollino national park, at the bottom of a narrow, 1km-deep canyon in the mountain, 23 people were saved by rescue teams who used ropes to descend the sides to reach a group of hikers who were at the area at the time of the heavy weather. This summer was not only extreme for Europe but for the entire northern hemisphere. Japan suffered from devastating floods, strong thunderstorms and long heatwaves in a period of a month! In California, 8 civilians and 6 firefighters were killed in a series of wildfires (6.004 different fires) that have burned an area of 5,808.30 km2, causing over $2.5 billion in damages, including $1 billion in fire suppression costs, thus, becoming the largest wildfire in the state’s history. 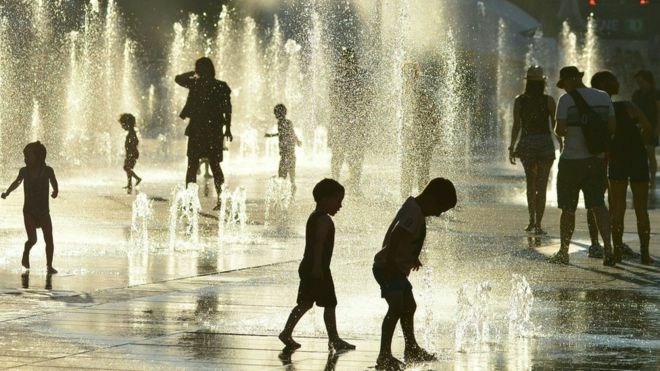 In Canada, more than 70 people died due to the high temperatures in the Quebec province during the first week of July, when the heat index hit the record high of 47°C. Across the planet, June was the second warmest on record, and considering that we are close to the La Niña period, in 2019 the temperatures are expected to rise even further. Finally, humans were not the only ones affected by the weather change. The impact on the biosphere is dramatic, as happened with the largest colony of royal penguins, which has been shrunk by 90%. According to the New York Times, satellite photos show that from the 500,000 pairs of penguins seen by scientists in 1982, only 60,000 couples remain in the South Island of Phorouni a French territory in the southern Indian Ocean. Scientists predicted that climate change would wipe out the royal penguins of the archipelago before the year of 2100.